Union County Freeholder Chairman Bruce H. Bergen, Freeholders Angel G. Estrada and Christopher Hudak, Acting Union County Prosecutor Grace Park, Union County Sheriff Joe Cryan and Executive Director of the YWCA of Union County Janice C. Lilien attend the 4th annual Union County C.A.R.E.S. (Community, Action, Response, Education, Safety) Domestic Violence Symposium at Kean University in Union. They were joined by David Fletcher, President of the Elizabethtown Healthcare Foundation and Shavar Jeffries, a partner with the law firm Lowenstein Sandler, LLP. Mr. Jeffries was the keynote speaker. 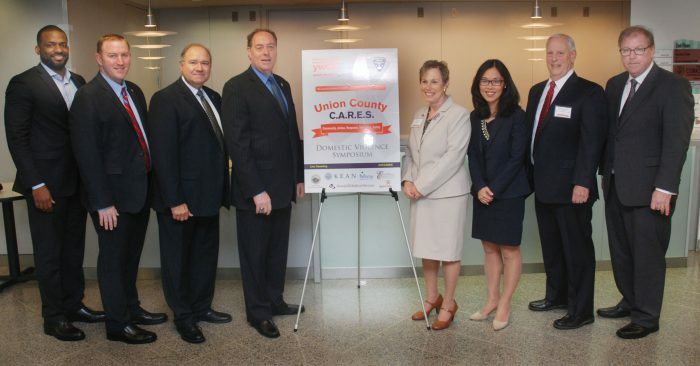 Symposium was sponsored by the Union County Prosecutor’s Office, YWCA Union County, Kean University, the Union County Board of Chosen Freeholders, the Elizabeth-based Family and Children’s Services, Iris House, Trinitas Regional Medical Center, and the Elizabethtown Healthcare Foundation. The Symposium was scheduled to coincide with the U.S. Department of Justice’s National Crimes Victims’ Rights Week, held this year from April 2 to 8 (for more information, go online to https://ovc.ncjrs.gov/ncvrw).